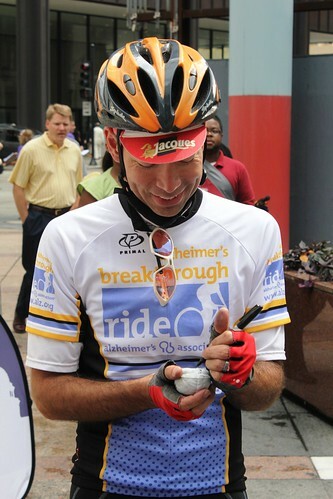 My journey on the Alzheimer’s Breakthrough Ride would consist of three days of riding. Two days to complete the Madison-Chicago segment and an additional day to ride the first leg of the Chicago to Indy segment. Each day brought something new: meeting great new friends, inspiration in the fight against Alzheimer’s, and great riding through America’s heartland. I finished up our lab work on Tuesday and headed to Madison, where the weather looked rather daunting for the following day’s ride. Bright and early, I met the other riders in the lobby of our hotel. Well not so bright due to the ominous clouds, but certainly early. The brightest parts of the morning were actually the team of riders – Barb Bendlin, Michele Riese, and Michael Walters as well as the incredible support staff, Evan, Glen and Melanie. We got to know each other over a hearty breakfast, and then it was time to ride! Miraculously, the heavy weather stayed ahead and behind us as we made our way through the rolling hills of southern Wisconsin toward the flat prairies of Illinois spurred on by cool temperatures and a slight tailwind. As others have noted, Glen and Melanie in the follow and lead cars did a great job of keeping the traffic at bay. The rain also kept mostly at bay, but we occasionally found ourselves pedaling through a chilly spritzing. Our spirits could not be dampened, however. After each stop, we began pedaling again with a rousing cry of “Breakthrough!” Barb and Michele had seemingly boundless energy while Michael, who had some reservations about the distance initially, began to realize his cycling potential with every passing mile. Things were going great until a set of slick train tracks in Edgerton, WI sent Barb and Michael to the pavement. When a police officer came by to offer help, Barb’s only request was that he sign the petition! Way to stay on message, Barb! After some patching and bandaging, we were on our way again. Breakthrough! The rain cleared out and we finally arrived at Woodstock, IL 90 miles, and 2000 kiloJoules later. We averaged a little over 100 watts of power output while riding – 4 bright light bulbs riding to abolish Alzheimer’s disease. Woodstock was a gracious host. Thursday was an eventful ride into Chicago. In the “+” column: We were joined by Alzheimer’s Association CEO Harry Johns, who would ride with us all the way into Chicago. In the “-” column was the rain and a flat tire just a few miles from our destination in downtown Chicago. We knew there was a crowd waiting to meet us, and the rain had already pushed us behind schedule, even forcing an unplanned shuttling of bikes and riders for part of the segment, so a quick tube change and we were on our way again. At about 1PM, we arrived at the Thompson Center to the cheers of the assembled crowd – an amazing and inspiring moment. The energy was high as some heartfelt speeches were made and more signatures were collected. Chicago’s my home town, so I couldn’t resist a quick trip into the lab to check on an experiment. Then it was back to the hotel to say goodbye to the Chicago-to-Madison team (see you in DC!) and to get some rest for Friday’s ride into Indiana. On Friday morning, Kevin Laxton and I set off in the chilly morning air with the sun rising over Lake Michigan as our backdrop. On the lakefront path, I saw some friends who wished us luck on our journey. We had about 90 miles to ride, but the open roads and beautiful prairie fields of Indiana made it go by in a flash. We happened to ride by Fair Oak farms in Indiana, so I convinced the crew to stop and try some cheese curds which squeaked with freshness. The woman at the checkout counter told us her grandmother suffered from Alzheimer’s disease and wished us luck on our ride. From there, it was a short ride to Rensselaer, IN where we’d stop for the night. Marc Prevot came in that evening to continue the ride with Kevin, and I headed back to Chicago full of inspiration and gratitude to have been part of this excellent endeavor. These three days were certainly some of the most meaningful miles I’ve ever pedaled my bike through. I’m looking forward to continuing the effort in DC. 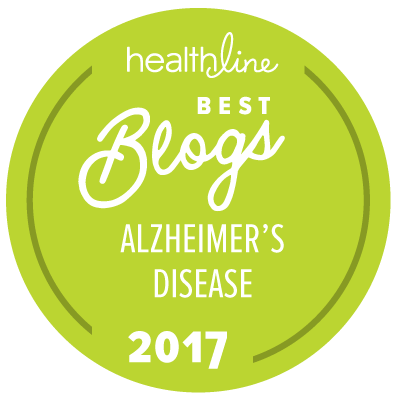 It’s time we made Alzheimer’s disease a national priority. -Eric Norstrom, Ph.D., is a postdoctoral scholar in the department of neurobiology at the University of Chicago.